Brett offers a complete array of binding Equipment for all the popular binding methods including ring wire, plastic coil, comb binding and 3-hole punch. Choose from combo punch/bind systems to modular semi-automatic medium or heavy duty electric punches with interchangeable punch dies. 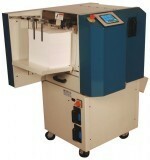 Production fully automatic systems also available.